Almost a year after a former Russian spy and his daughter were poisoned in the British town of Salisbury, fresh evidence uncovered by the investigative website Bellingcat appears to place one of the suspects in the vicinity of another series of poisonings in Bulgaria in 2015. Travel details obtained by Bellingcat and shared with CNN appear to show that a suspected Russian operative — known by the cover name “Sergey Vyacheslavovich Fedotov” — visited Bulgaria on two separate occasions in April and May 2015, around the same days that a Bulgarian arms manufacturer Emilian Gebrev and his son Hristo were poisoned. Around the time of both Bulgarian poisonings, Fedotov appears to have skipped his original return flight to Russia, in a pattern he seemingly replicated three years later following the attack in Britain, according to Bellingcat. In that case, Sergei Skripal, a former Russian double agent, and his daughter Yulia were found slumped over on a bench in Salisbury last March after being exposed to a military-grade nerve agent. British authorities blamed the attack on hitmen from Russia’s intelligence agency, the GRU. The revelations about the poisonings in Bulgaria three years earlier raise the prospect that the Salisbury attack may not have been the first time a nerve agent was used by Russian agents on EU soil. It could also mean businesspeople in sensitive sectors have been targeted — not just former spies. Speaking to CNN this week, Gebrev, 65, said he fell ill sometime around April 25, 2015 and collapsed days later at an event he was hosting in Sofia. He believes he may have been poisoned in a restaurant but said he could not be sure. He was admitted to hospital on April 28 suffering blurred vision, vomiting and blackouts, and eventually slipped into a coma. His 40-year old son also fell ill, as did his factory director. All three eventually recovered, but still suffer recurring symptoms to this day, Gebrev said. Reviewing a combination of Russian border control data and flight bookings which were shared with CNN, Bellingcat says it determined Fedotov flew from Moscow to Bourgas in Bulgaria on April 24 and had a ticket booked to depart from Sofia on April 30. Instead, he flew back from Istanbul in neighboring Turkey two days earlier, on April 28, the day Gebrev was admitted to hospital. The same travel records show he returned to Bulgaria on May 23, failed to take a return flight from Sofia five days later, and instead made his way back to Moscow on a May 30 flight from Belgrade, a roughly five-hour drive from the Bulgarian capital. These dates correspond with the time Gebrev says he fell ill for a second time, though he did not provide CNN with specific dates of his second round of hospital treatment. He said the poisoning has left him anguished with lapses in his memory. Bellingcat’s travel records also place Fedotov’s GRU passport in the UK around the time of the Skripals’ poisoning on March 4, 2018. He arrived in the UK on March 2, but although he had a ticket to leave two days later, he appears to have skipped that flight too. Since then he has vanished. His current whereabouts and true identity remain a mystery. Central to Gebrev’s case is a medical report compiled in June 2015 by the Finnish Institute for the Verification of the Chemical Weapons Convention — an accredited test center of the Organisation for the Prevention of Chemical Weapons — to which Bulgaria sent the Gebrevs’ urine samples, amid concerns they may have been targeted with a banned substance. The test results, obtained by Bellingcat and seen by CNN, concluded the men had been poisoned with a strong organophosphate and a second substance which they were unable to identify with standard chemical weapons testing tools. Organophosphates can be used as insecticides, medicines and nerve agents. Novichok, the poison used to target the Skripals in Salisbury, belongs to this class of chemicals. Novichok, which was designed by Soviet scientists to be hard to detect, was not identified in the samples. But several banned chemicals were listed as possible candidates for the poisoning, including Parathion, a strong insecticide, and Amiton, another type of pesticide which is also considered a member of the VX family of nerve agents. The Finnish institute did not immediately respond to CNN’s request for comment. Gebrev owns a munitions factory, EMCO, in Bulgaria, a country with a historically large defense industry — a legacy from the time it spent behind the Iron Curtain. Founded in 1992, EMCO sells an array of munitions to many parts of the globe but does not publicize the type of weaponry it makes or its export markets. A report on Bulgaria’s arms business by the peace-promoting organization SaferWorld claimed that by the year 2000 EMCO had become one of the country’s largest privately-owned arms manufacturers and had sold $25 million dollars of weapons to African nations, including Ethiopia and Angola. More recent data on EMCO’s activities have been hard to source. Bulgarian media have reported, however, that it was EMCO’s deals with Ukraine as it fought off an incursion from Russia in 2014 that may have made him a target a year later. Although Gebrev confirmed to CNN he did ship his wares to Ukraine, he doubted this would have made him a target. British authorities have remained tight-lipped about the motive behind Russia’s attempt on the Skripals’ lives last year. 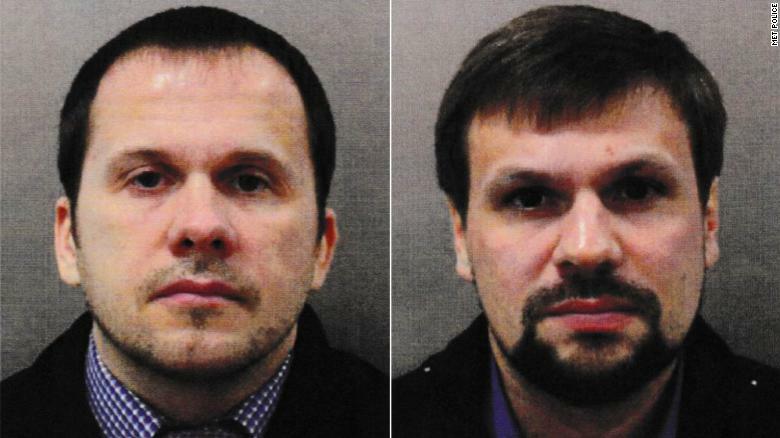 Salisbury attack suspects Alexander Petrov, left, and Ruslan Boshirov. CNN revealed in July that the UK had identified two Russian GRU suspects via CCTV who flew out of the country soon after the Skripals became sick. However, it took until early September before the Metropolitan Police, whose counter-terrorism unit is running the Salisbury probe, charged the men, using their fake names. Weeks later, Bellingcat revealed their true identities. Both men maintained later on Russian television that they were businessmen and had been visiting Salisbury as tourists. Kremlin spokesman Dmitry Peskov said his office had seen the report, published late Thursday by Bellingcat, but had no reason to believe its veracity, and questioned why the information was emerging now. “We don’t know if it has anything to do with the reality and whether there is any truth to it all,” he added.